Note: Its better for those seeking PhDs, and postdocs in data science. *Copying their whole message. If you qualify and really serious about this program, I will be happy to write a review for you(only if I know you). Email me. No Facebook message. You recently wrote a recommendation for The Data Incubator. We were very impressed by the caliber of applicants you know. Our application is currently live. I would be extremely grateful if you could forward this opportunity onto masters and PhDs whom you think would make good applicants. 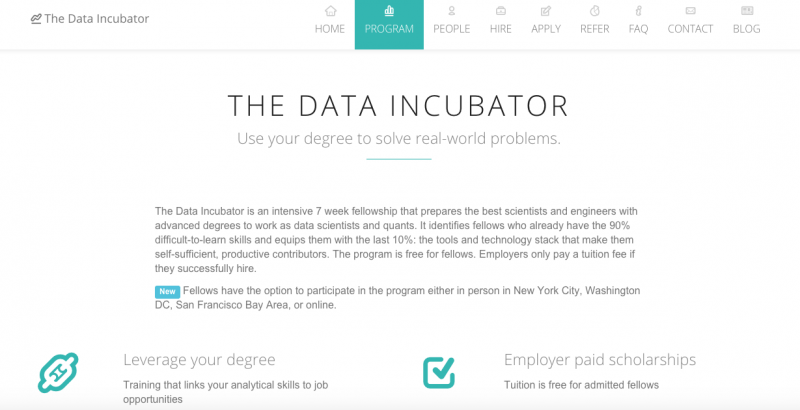 Program: The Data Incubator is an intensive 7 week fellowship that prepares masters, PhDs, and postdocs in STEM + social science fields seeking industry careers as data scientists. The program is free for fellows and supported by sponsorships from dozens of employers across multiple industries. In response to the overwhelming interest in our earlier sessions, we will be holding another fellowship. Locations: There will be both an in-person (in NYC, DC, SF) and online section of the fellowship. There is a common application for both the online and in-person sections. Who should apply? : Anyone within one year of graduating from a masters or PhD program or who has already obtained a masters or PhD is welcome to apply. Applications from international students are welcome. Everyone else is encouraged to sign-up for a future session. For additional information, checkout our blog, Venture Beat article, or Harvard Business Review piece.